There is a Meatball for Everyone — Dine on In! You guys, there is such a thing as national meatball day! Instagram had a whole bunch of fun stuff surrounding that day, which got me thinking, "I love a good meatball, but I also really enjoy the vegetarian and the vegan versions of the carnivore counterpart". I wanted to share with you the dishes that I make at home for friends that has been part of my kitchen rotation for some time now. From Vegan to Carnivore, there is a Meatball for Everyone! The first is my all time favorite the "beetball". I tend to spend time eating plant based when possible. Primarily because plant based cuisine photographs so well because of all the color, and secondly, it CAN taste just as great as the meat counterpart (my boyfriend, bless his heart, endures a plant based cuisine any time I cook a dish, and he also enjoys a ham sandwich afterwards, lol!). This beet ball is made with leftover black beans and red beets! I know right? It's usually served with zucchini noodles or regular spinach noodles (which I tend to like more and paired it this way so that my guys and I can eat together (Perfect for the picky eater in your life ). I add a drizzle of Red Chile Pepper Roasted Oil to give it some body and also give in depth in flavor. Want to try it? (get the recipe here). 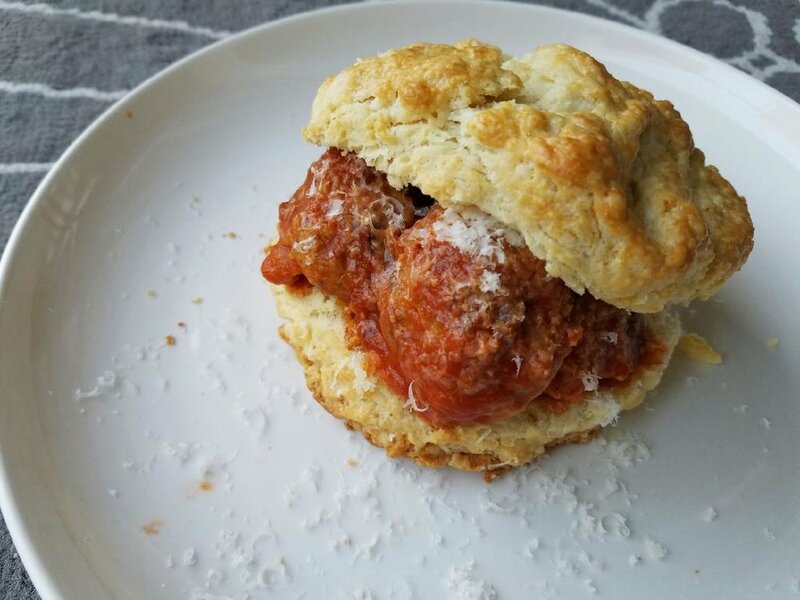 The second, is my all time favorite, a meatball biscuit sandwich. I make this quite often at home, because I love fresh bread from the oven smell and also because we use these meatballs often in meals, you know the usual stuff, spaghetti and meatballs, meatballs and polenta, and meatballs as little bites of yumminess! The 3rd and by far my most inventive one is the Yucca Squash Veggie Meatball. It's made with roasted carrots, roasted spaghetti squash, yucca. It's rolled in coconut flour and baked, which allows the water from the squash to evaporate and create this beautiful mouthful of flavor! The key is to roast these veggies with you favorite seasonings so that it's not bland once baked. I serve this with curry sauce, and some kale, it makes a hearty dish and I don't even miss the meat! So there you have it- all my favorites in one. As always, I tend to keep my recipes very simplistic, and I usually like to rely on my oven to the the heavy lighting. This gives me time to do other tasks while the cooking is going, like writing the blog content or working on another blog post. Make sure you click on "Want to try it? (get the recipe here)" to get all the details on each dish.